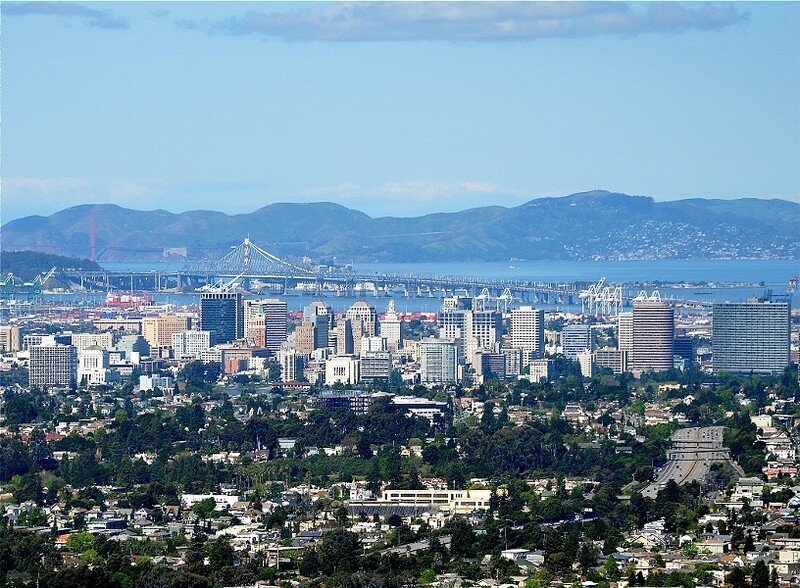 Downtown Oakland has approximately 15 one-way streets in the area around Broadway and Lake Merritt. It would seem that the city was designed to be driven through with cars, rather than lived in by people. When did we give up the right to the city? When did we decide that downtown Oakland is for four-wheeled horses of steel and oil instead of living, breathing, culturally rich human beings like you and me? It goes back to home ownership, which was pitched in the years following World War II as the antidote to rising communism. You can see this in the way our cities shifted away from apartments and toward single-family homes during the Cold War. Clearly, it worked. The canonical American Dream is to own a home. By contrast, collective housing as a co-op or even an apartment building is a form of socialism. It’s about people living together and sharing experiences, or at least in very close proximity to one another. Likewise, mass transit is in line with socialist values: people collectively getting to and from places – on trains, buses, or ferries run by our government. On transit owned by all of us. Suburban housing tracts and sprawl, on the other hand, have their roots in capitalism and individualism — a man’s home is his castle and so on. It’s also car-centric with people traveling alone in their privately owned vehicles. Perpetuation of suburbia is diametrically opposed to the furtherance of collectivism. The private automobile represents extreme individuality as you travel in a bubble of private space. It’s also terribly destructive: It’s caused catastrophic environmental change through the overconsumption of fossil fuel. Our city’s founding document, in other words, elevates individualism and capitalism over living and commuting collectively. And most of us have done so as well – perhaps without realizing it. I’m quite certain you’ve been on a packed AC Transit bus held up behind a row of private cars at the light. Public transit is a form of collectivism and here in the liberal state of California, we have decided it is more important for the individualist automobile to move swiftly through downtown Oakland than it is for a loaded bus of 50 to arrive at their destinations. It’s no secret that the most effective way for us to change — to get people to use public transit — is to bring people to transit by allowing them to live next to it. It will provide people with a public, collectivist alternative to the car-dependent, individualistic suburban lifestyle. And Senate Bill 827, authored by state Sen. Scott Wiener of San Francisco, and co-authored by state Sen. Nancy Skinner of Berkeley, is poised to play a critical role in dismantling the hegemony of automobile and suburban individualism. If passed, it’ll allow people to live collectively again, in apartment buildings in cities, next to transit without need for cars. By no means is SB 827 the silver bullet to our housing shortage, nor will it desegregate our cities by reversing redlining overnight. It’s also no substitute for more powerful tenant protections such as expanded rent control. Those are all pieces of a larger picture in which we must follow through on securing the human right to shelter for all. However, SB 827 is a direct attack on the legacy of cold war anti-communism. It says to cities, "You can't ban collective, communal living around collective, communal connectivity with other collective, communal places of living". Of course, we don’t have many options for truly communal, collective living arrangements in 2018. A major cause of that is cities that have quite literally banned collective living in favor of the “American Dream” of a single-family home with its white picket fence and 2.15 children. Much of Rockridge, for example, is zoned for wealthy individualism, with luxury single-family homes. It is illegal to build more than one or two homes on most lots there. SB 827 won’t unleash a flood of pent-up social housing production. Not immediately, at least. In fact, Article XXXIV of the California Constitution implements an effective ban on public housing. We have a long way to go. Not surprisingly, SB 827 is opposed by those who bought in to the anti-communist dream of a single family home. Many wealthy cities and counties fiercely oppose it. But so do many members of anti-gentrification movements. It’s a strange alliance that is full of contradictions. When owners of multimillion-dollar mansions in Marin co-opt the language of racial and economic justice, all legitimacy goes out the window. It is not possible to compromise with inhabitants of the Berkeley hills in a way that both preserves their individualist lifestyle while abating the forces of gentrification; in fact, a primary driving force behind gentrification is communities that have successfully used their levers of power to erect invisible walls of low-density zoning around incomprehensibly valuable public transit hubs. Opportunity hoarding is not sustainable in the long run; the people invested billions in our BART system, and the people should be getting back some benefits. Concerns of displacement and gentrification in vulnerable communities are legitimate and must be addressed. Concerns regarding the “Manhattanization” of Rockridge are hollow and hypocritical. Using a lens of anti-communism makes it rather easy to see that SB 827 is going to be opposed by those who seek to maintain our extremely destructive culture of individualism. They've got a whole way of life to lose. SB 827 is a referendum on the cold war generation's choice to adopt this extreme individualism as our dominant culture. There is no future in which we preserve these mechanisms of opportunity hoarding and also address vast wealth inequality. If we want a future that includes all of us, we as Californians must endeavor to take on seismic change; the kind of change that breaks old political alliances and forges new, more powerful ones. SB 827 has the potential to lift the stranglehold that single-family homeowners have on our land-use decisions while lifting people up out of poverty and housing insecurity – in a collective way. But only if we want to. I, for one, do. Will you join me? Victoria Fierce is a pro-collective-housing, radical socialist. She’s also a YIMBY (Yes in My Backyard) who organizes with East Bay for Everyone and a co-executive director of CaRLA, a group that sues cities and the suburbs to restore a legal environment in which California builds housing equal to its needs.